At FitChick CPR, we offer a number of courses, including: Heartsaver® (First aid, CPR, and AED techniques to assist adults, children, and infants), Family and Friends® CPR courses, BLS For Healthcare Providers, CPR Parties, Babysitter’s Safety Course, Lunch and Learn Seminars, and Fundraising with CPR. This course can be customized to focus on any combination of First Aid, CPR and AED (Automated External Defibrillator) training. Class length varies from 3½ hours to 8 hours depending on coursework. Ideal for people with limited or no medical training, and/or professional rescuers who may need to act as first responders and deliver first aid to victims with medical and environmental emergencies at work, home, or in the community. 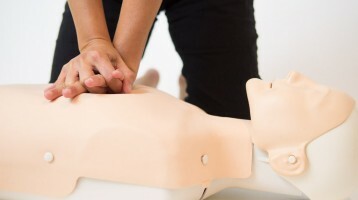 Classes are specifically designed for rescuers who are required to obtain a credential documenting completion of a First Aid Course with CPR & AED. Multiple learning activities are included, using DVD’s, practice-while-watching sessions, skills and written testing sessions. A course certification card will be issued within 30 days after successful completion of the course. A 2½ hour course designed for people with limited or no medical training such as teachers, students and family members of patients at risk for sudden cardiac arrest, and other laypersons who want to learn life-saving CPR skills. Recognize choking and help a choking victim. The class includes multiple learning activities, using DVD’s, practice-while-watching sessions, and skills practice sessions. A course completion certificate will be issued within 30 days after successful completion of the course. This 4½ hour course is specifically designed for participants who work in a healthcare setting and those who are required to take a healthcare provider course for their employment. The course can also be used to train laypersons to be eligible to take the BLS Instructor Course. A course completion card is issued to participants. Use of an Automated External Defibrillator (AED). It also includes instruction in one and two rescuer CPR and relief of foreign body airway obstruction in adults, infants, and children. The course includes multiple learning activities, using DVD’s, practice-while-watching sessions, and skill testing sessions. There are both written and skills testing examinations. Host your own CPR party with any theme of your choice and include CPR training. Every guest will learn CPR and other skills that could save a life! As a bonus, the host receives the training for half the price! This course is specifically designed for 11 to 14 year olds who want to learn how to babysit safely. The course covers being home alone, preparing for babysitting, growth and development of children, and activities to entertain children of varying age levels. It also covers recognizing emergencies, calling 911, as well as adult, child and infant CPR and choking rescue techniques. This seminar includes demonstrations on what CPR is, how to administer CPR and what people can do in case of an emergency. Seminars include learning the risk factors of a heart attack along with stroke and what warning signs to look for. Understand what a heart attack is, cardiac arrest is and a stroke. CPR Fundraising classes are a great way to raise money while teaching people how to save a life in case of an emergency. 15% of all proceeds go to your organization! MAKE FITCHICK CPR CLASSES A PART OF YOUR NEXT EVENT! Contact us today! This one-hour course includes a workbook with a completion card, a Power point presentation, and basic hands on practice. The course is designed to meet Occupational Safety & Health Administration (OSHA) requirements for bloodborne pathogens when paired with site specific instruction. Utilizing the “PACT” acronym (Protect, Act, Clean, Tell) and the slogan, “Make a PACT Know How To Act”, the students learn actions to take when there is a danger of or an actual exposure to bloodborne pathogens in the workplace. Act when exposed to blood or blood-containing materials in the workplace. Clean themselves and the area when exposed to blood or blood-containing materials in the workplace. Tell or report any exposure to blood or blood-containing materials in the workplace.